I don't usually consider an item to be "finished" until it's blocked, but as I'm not going to have time to block this today, and because I have grown to love the look of garter stitch, I'll tell you about it now and post another picture of the whole thing truly finished on Sunday, for this is a stash-busting project (yay!) and therefore part of my Year of Projects. As ever, I'm linking with the lovely bloggers at Tami's FO Friday. Hi Sarah, I've loved doing this and thank you for the support. Yes, that was my first glitch too. I also often jump into patterns without reading everything .I think its the excitement to start.Looks lovely! Do any of us every learn that lesson?? It looks great, though! What a great pattern and such lovely colours too. You can't beat a bit of garter stitch. 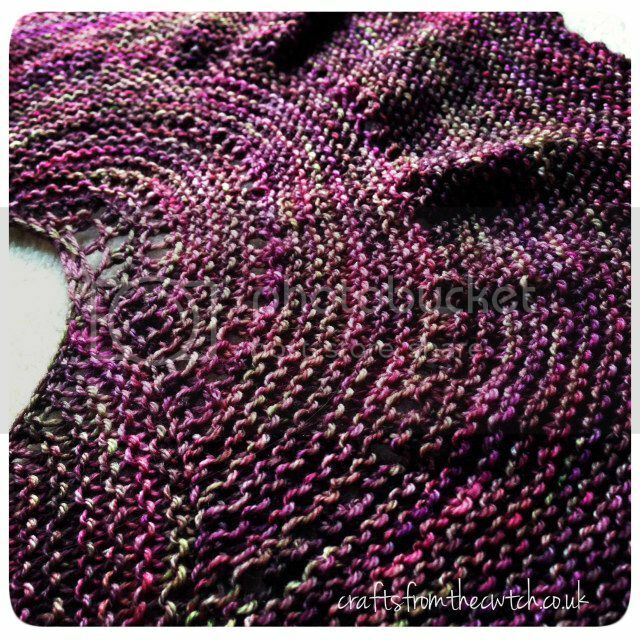 That's a beautiful shawl and I love the yarn you've used. I've got a skein of that (but in a different colour) and I've spent the morning looking for patterns. I'm a big fan of Malabrigo, I love the colours on this one. Gorgeous. That looks so pretty, I like the colour very much. I've got a skein of sock yarn which would look lovely in that pattern. Thank you for the idea. Perfect combination of yarn and pattern, I love it! Love the colors you choose :) Even if it isn't blocked yet, looks awesome. It's lovely even before it's blocked, a lovely colour and pattern. I never learn either, just rush in without reading the notes properly because I'm so eager to get started. Well done on another stashbuster! Have a great weekend . I like this, very much ... and I have the perfect yarn ... Sarah, you are so not good for my resolve to finish a few projects before starting any more! 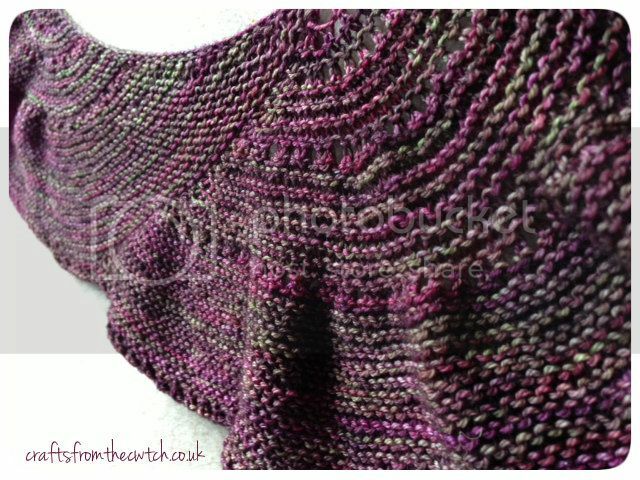 I think it looks beautiful even if it is unblocked :) And would be wonderful to see how the other skein would look done with this pattern too!